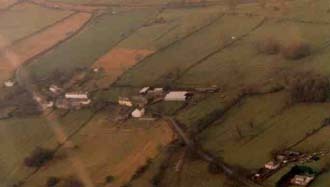 The Hayloft Self-Catering Holiday Accommodation Aerial Photograph of rural Redmain Page. Please click on picture to display full size on screen. There are only about twelve houses in the Hamlet of Redmain. The Award Winning Village of Blindcrake is only one mile from Redmain along a country road with beautiful valley views.